At last he hushed and I whirled back to the cat. I couldn’t keep an evil smile from forming on my lips. My patience had been rewarded. At last I had this cat exactly where he wanted me. I was all set to go streaking off on my mission, my very important mission of breaking up the gang of Turkey Bandits, when all at once Drover spoke. That was odd. All at once, Pete stuck his paw through the hogwire fence and delivered a handful of claws to Drover’s tail section. The little mutt jumped straight up into the air and took refuge behind me. And with that, I hit Full Throttle on all engines and went roaring off to intercept the enemy. Sally May would be SO PROUD! Whether Pete knew it or not, he had given me a great opportunity to pile up some Goodie Points with the lady of the house. You might recall that our relationship had experienced its share of... well, ups and downs, shall we say. Tiny misunderstandings that had grown into something fairly serious. Sometimes, when she looked at me and one side of her upper hp rose into a snarl, I even got the feeling ... well, that she just didn't like me. Okay, I'd caught myself a little nap that very afternoon, but only because sheer exhaustion had finally dragged me down. 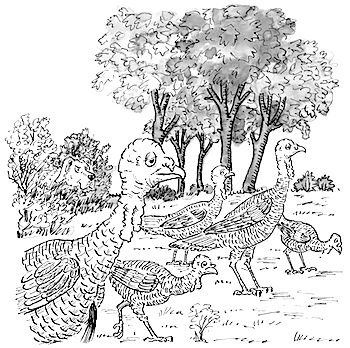 But the point is that I was now on a mission to save her precious corn from marauding bands of wild turkeys. You see, that bucket contained the family's entire supply of food for the winter. Yes. She was drying it, preserving it for the long cold winter months-months of wind and snow and snowy wind, months when her precious children would wake up in the morning, cold and hungry and crying for bowls of dried corn. Gee, I sure hoped that Baby Molly grew some more teeth. She only had three or four teeth, and she would need a pretty good set to chew up that dried corn. Even horses have trouble chewing dried corn. Well, by the time I roared past the trees in the shelter belt, bending them almost to the ground in the wake of my powerful engines, I had worked myself up into towering rage. Anyone who would steal food from innocent children would have to deal with Hank the Cowdog. Zooming south from the shelter belt, I began picking them up on VIZRAD (Visual Radar). Holy smokes, I'd never seen so many wild turkeys in one bunch. There must have been fifty of them! Whole families. All sizes and shapes. Hens, toms, and whatever you call the young' uns. Squabs? Chicks? Poults? Turklings? it didn't matter what they called themselves. To me they were all thieves and robbers, and their actions were proving it. They were pushing and shoving and fighting for the right to steal Sally May's entire winter ration of food.